The technical use of adsorption processes reached increasing importance during the last decades. The applications are widely diversified, ranging from biogas processing to medical technology or gas storage. 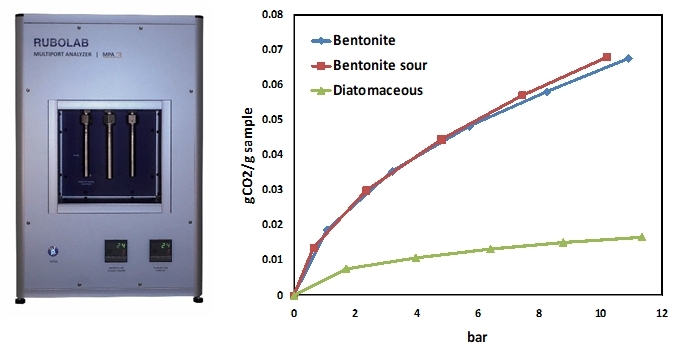 The manometric method is a well established technique to measure adsorption isotherms. Major advantages of manometric instruments are short measurement times and a high grade of automation. October 2016: Relase of our manometric instrument in an new compact design! This instrument allows the simultaneous measurement of up to 5 samples. The fully automated apparatus is developed for time saving measurements like material screenings. It can be used to measure adsorption isotherms at pressures of up to 100 bar and within a temperature range of 20°C and 300°C.The temperature controlling occurs by means of an electrical heating device. Sample temperatures down to – 20°C can be achieved using a thermostated bath. Moreover, the system can be equipped with a liquid nitrogen cooling device. An adjustable geometry of sample containers allows highly accurate sorption measurement on smallest sample amounts. The new version of our Multiport Analyzer contains proven measurement technology in a new compact design! The instrument is also available in 1- and 3-port versions. For costumer specific solultions please feel free to contact our technical staff. Best possible measurement accuracy is ensured by using high quality pressure and temperature sensors. A user-friendly software interface allows the programming of all measurement parameter. In addition, online data is used for integrated calculation of measurement results (e.g. sorbed gas amount). The standard version of our instrument can be modified accoriding to costumers specifications (e.g. extended pressure range of up to 200 bar, integration of cooling device). In course of manometric adsorption measurement, a dosing volume with calibrated size is pressurized with sorptive gas. 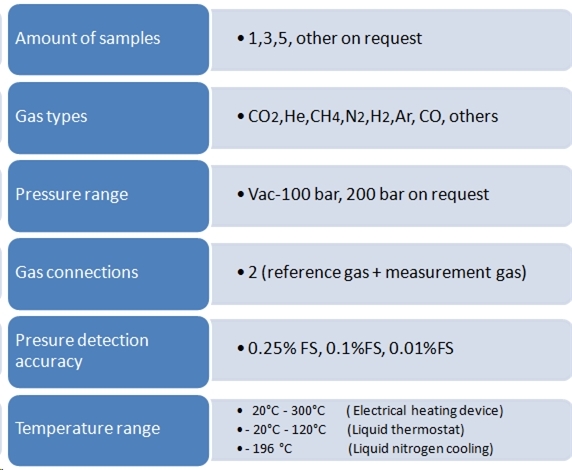 After detection of pressure and temperature values the gas is expanded into a sample volume, including sample material. The resulting pressure decrease is based on volume increase and sorption effects. The sorbed gas amount can be calculated using a gas mass balancing. 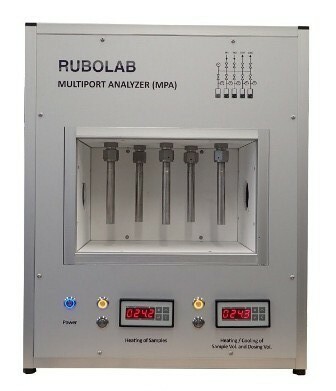 Based on the commonly used manometric method the RuboLab MPA uses an improved measurement method which allows the simultaneous measurement of several sample materials. Thereby the sample volume is equipped with additional pressure and temperature sensors. After expanding the sorptive gas into the sample volume, the sample volume will be separated when the pressure signals of both sensors are equal. Consequently the sorption based pressure decrease is mainly detected by the sensor placed in sample volume. In this way, the dosing volume is free to be used for another sample. 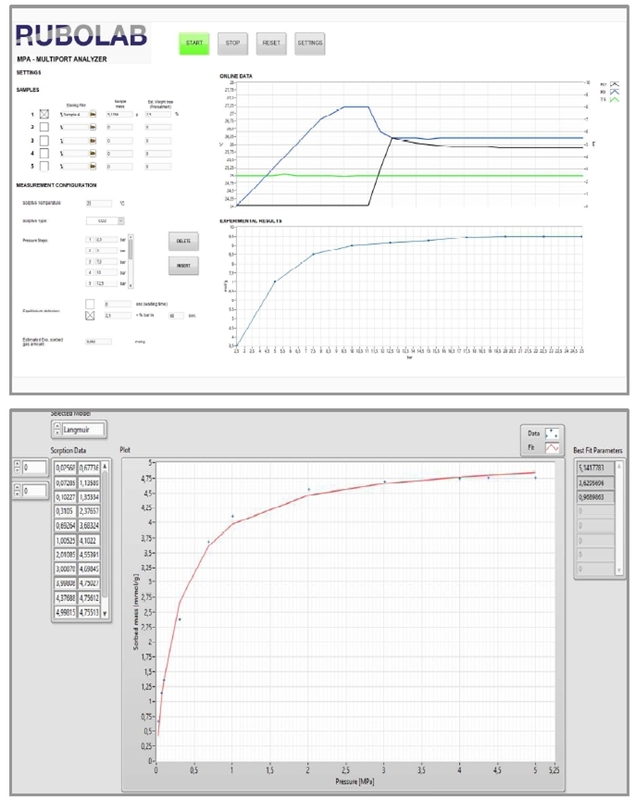 The improved manometric method of RuboLab MPA allows a time and cost efficient measurement of up to 5 sample materials within a wide pressure and temperature range. In former measurement campaigns the instrument has been used to measure hundreds of isotherms in only a few weeks.Thereby, the workload of the user is minimal, caused be automated measurement performance (including pretreatment, reference measurement as well as adsorption measurement) and integrated isotherm calculation! 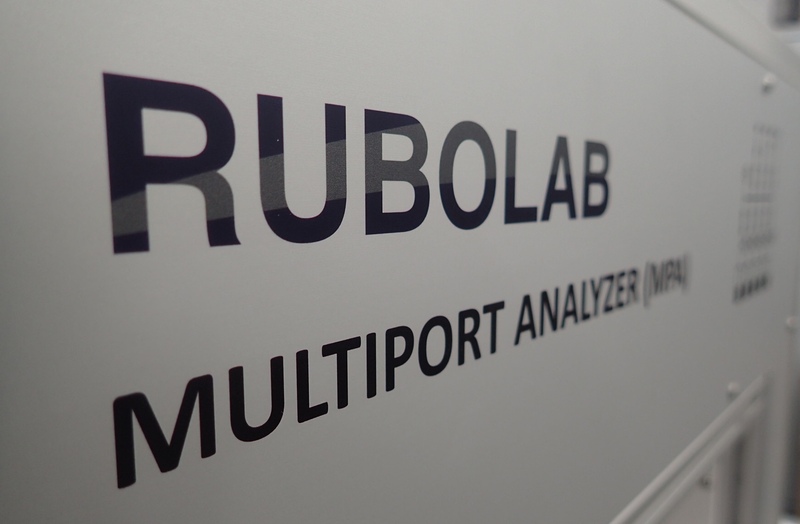 The Multiport Analyzer is delivered with the RuboLab MPA control software, which can be installed on a Microsoft Windows PC. On its user friendly interface, all measurement parameters can be programmed. The collected data is then used to calculate the adsorbed gas amounts. The measurement presets, the gathered data as well as the correlated parameters can be exported to text files. Our Premium Software upgrade includes uncertainty calculations according to GUM1 for every isotherm point. This feature is of special interest for high quality research and corresponding publications. In the wake of the energy transition, CO2 capture and storage (CCS) is gaining increasing interest. Research groups around the world are working on the development of efficient CCS technology. 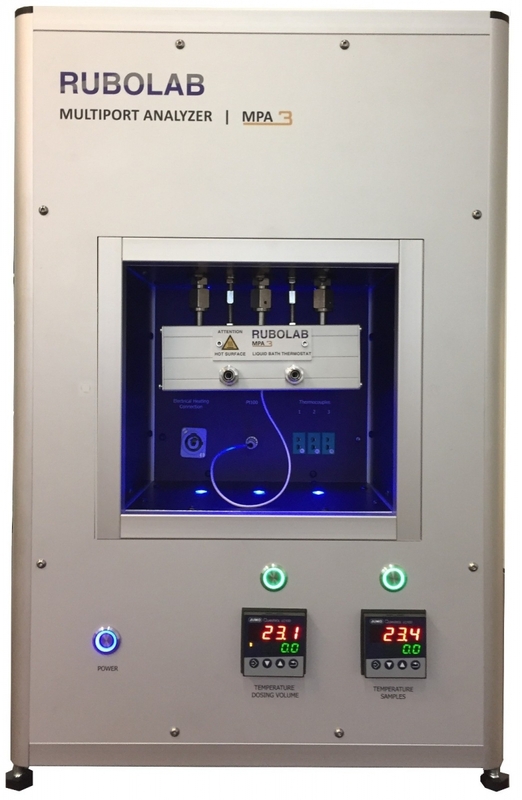 In this context, our manometric adsorption measurement instruments of Rubolab MPA series provide powerful systems for the time-saving characterization of various sample materials. The left picture shows three CO2 isotherms measured on different types of rock (measurement has been performed with MPA-3).